Bake My Day! : Bread Baking Babes bake savoury bread! Bread Baking Babes bake savoury bread! The aroma of bread being baked is an enticing one, this month's bread ranks even higher on the mouthwatering scale. Lien (Lien's Notes/Notities van Lien) was our honored Kitchen of the Month and she decided on a bread featuring the bounty of the season; Asparagus! For the instructions please visit Lien, I had to make one major adjustment in the Asparagus department. Meaning that when I was ready to bake the green asparagus I needed were nowhere to be found. My substitute consisted of the greens of a bunch of spring onions, sauteed in 1 tbs of walnut oil, adding rocket and some parsley just before taking it off the heat. I know by doing this I lost a lot of the seasonal quality of this bread but got a great aromatic oniony bread in return. Not a bad deal at all! I proceeded as described in the recipe. Kneading the dough to incorporate the additions can be quite tricky, I found it works best to treat it like you would a cinnamon swirl bread. Pat the dough into a rectangle, spread ingredients over the dough, roll up and tuck the ends under to form a squarish package and let rise as such. 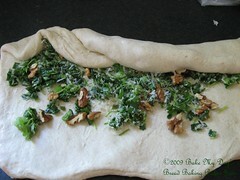 Over kneading will result in the release of a lot of moisture and you'll end up with a "slippery when wet" dough. I shaped the dough in one large tapered loaf and baked it for 30 minutes on 220C, lowered the temp to 180 and baked for another 15-20 minutes. Definitely going to bake this one again, I really want to try this with adding some spinach leaves and blue cheese instead of parmesan! Great bake-up Lien, proportions worked out great for our Dutch flour! So what's keeping you? 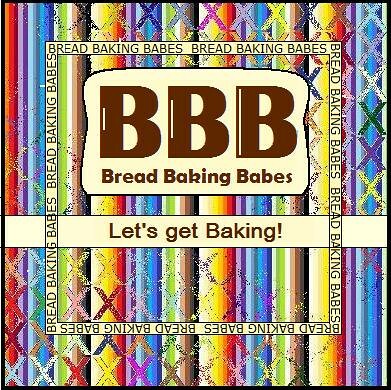 Come on and bake with us and earn your Bread Baking Buddy Badge by baking this bread and sending your details to Lien (notitievanlien(-at-)gmail(-dot-)com). Deadline is June 26th. For real asparagus bread check the other Babes in the right hand sidebar! Oh my goodness, did you say blue cheese?!? That would be amazing. I will try that next time too. I agree, this loaf is infinitely adaptable - yours looks delicious. 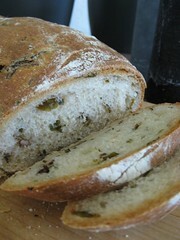 Mmmm, I can almost smell your bread here (even though it's probably all gone by now), lovely with the spring onions. Your loaf looks beautiful, love that crust! So here we have Asparagus Bread ... with no asparagus. Hehe how very excellent. Your loaf is beautiful. You seem always to get just gorgeous crumb. Guess now I need some of those onions to try it with. I think spring onions sounds like a wonderful ingredient! 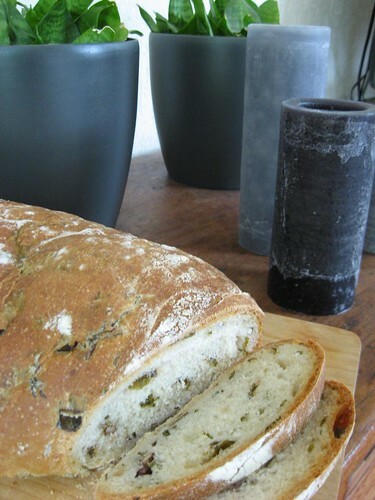 Your bread looks lovely, and if you do try it with blue cheese, please post about it! I'm sorry I missed it Saturday! It looks great, very light and crunchy! Helemaal heerlijk, ik moet bekennen dat ik bij het bakken in het Engels vaak alleen de titel lees aangezien 'het' er toch nooit van gaat komen.. maar deze klinkt bijzonder aantrekkelijk! Hoewel halfcups in de reacties zegt dat er geen asperges in dit brood zitten.. This bread looks wonderful! I'm going to use my last asparagus to bake it (although I will try it with a higher ratio of whole wheat). I'm so glad I found your blog. I was lucky enough to live in the Netherlands while my husband did his postdoc in Wageningen, and we came back to U.S. with a new way of looking at things that still informs our life. I've started blogging about what I'm doing and learning on my own 44 acres near Madison, Wisconsin. I wrote about bread today and included your blog. En.. ik zou je graag als kookboek gebruiken, ben op zoek naar het goeie, bewezen recept voor pancakes, de nieuwe verslaving in dit rare huishouden... heb je dat ergenst staan? Of heb je daar een (uitgeprobeerd) recept van? Dangit, I almost got blue cheese to put in this - it sounds wonderful!